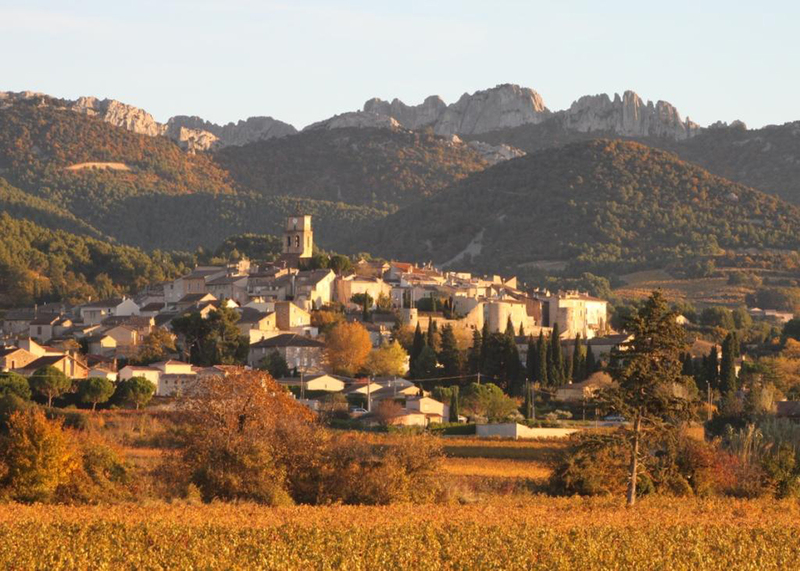 Not only a natural kingdom populated with oak, aromatic Mediterranean shrub, and stands of Aleppo pines, the small and rumpled mountain chain called the Dentelles de Montmirail is also home to a group of historically and culturally preserved hamlets like Séguret, Gigondas, and this week’s featured wine source, Sablet. Anchored as a former bastion on a prominence nearby to the lacework of limestone outcrops (‘dentelles’), the ringed cluster of terra cotta-roofed stone houses, shops, and cobbled alleys personify the town’s medieval history, but also hint at its roots in antiquity. For 500 years as of 1274, the surrounding land and connecting waterways were part of a Papal realm known as the Comtat Venaissin. Ceded to the Catholic Church by various, minor French kings, the enclave was home for a succession of nine displaced Popes who had fled Rome due to political revolt. It remained in their control up until 1791 when all the holdings were reintegrated into France as a part of the new order that followed the French revolution. Framed by the Rhône River to the west and Provence to the south, this desirable territory also includes the prestigious Châteauneuf-du-Pape (‘the Papal Castle’). Globally renowned, this AOC (appellation d’origin controlee) still anchors the region’s modern-day reputation, though it was the visionary Romans who adapted the early grape varieties; who introduced the technology of terraced vineyards — and then went on to launch the area’s export trade via barges; down the Rhône, its tributaries, and out to sea onto their thirsty empire! Vintners in the Southern Rhône have been cultivating Grenache Noir, Syrah and Mourvèdre vines for 14 centuries. Being well-suited to a regional climate in which the daytime heat of summer is tempered by the cooling Mistral breezes, and where a very long growing season promotes full maturity of the fruit, these three plump and prolific varieties form the backbone for the Rhône’s signature blends of red wine known as GSM. In the region’s more recent history, Cave Le Gravillas is among a group of small producers who, with a steadfast commitment to refining terroir-specific wines in the peripheral shadow of Châteauneuf-du-Pape, have also developed an international profile by offering their bottlings at a fraction of their famous neighbour’s prices. Sablet is one of 18 villages that’s permitted to add its name to the AOC Côtes du Rhône – Villages. Generally, ‘Villages’ references a more rigorous regime of planting density, harvest yields, blend proportions, and minimum alcohol levels. Whether these factors translate into a consistently better grade of wine than the generic standard is debatable, and variable from year-to-year. What’s less uncertain is that the vineyards which surround each village, coupled with their local wine finishing traditions, does yield a distinctive flavour profile for their unique recipes of GSM. For my baseline tastes, as an admitted fan of medium to full-bodied, somewhat earthy, berry-forward red wine with polished tannins and less oak influence, this 2nd release of Villages Sablet 2014 is a balanced bottling that’s equally satisfying as apéritif or with dinner fare. This is a perennial LCBO Vintages favourite, so the available stock will evaporate from shelves quickly. As for sidestepping the impending mid-Winter blues, I suggest that you try to buy and stow away half a case! As Grenache Noir makes up most of the blend (70%), its rich blackberry aromas and flavours dominate — with the Syrah (25%) and Mourvèdre (5%) adding subtle spice and pepper notes. Try this alongside wine-braised lamb and pearl onions, stir-fried pork and cabbage, beef Kefta brochettes, a savoury stew or spicy squash tagine. 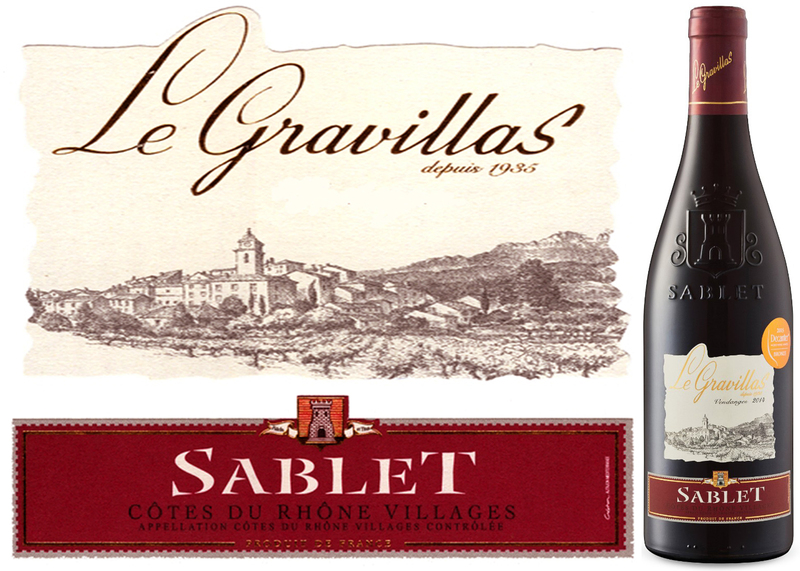 This entry was posted in Red Wine and tagged Cave Le Gravillas, Côtes du Rhône Villages, GSM, Sablet by Stephan Droege. Bookmark the permalink.